Calypso Cafe in the Coronado Cays offers Million Dollar View with affordable prices and has something for almost everyone. Where else in San Diego can you have a Lasagna Dinner with a glass of wine for $9.99* and watch yachts cruise by? I can see why my friends in the Cay's keep it secret. Great food at affordable prices is a rarity these days and to be by near the beach and eat breakfast, lunch or dinner while watching yachts going in and out of the Bay is unbelievable. The Cafe is family and dog friendly and welcomes four legged friends on the patio. You don't have to stop at the guard gate. He is friendly, wave "Hi" as you drive by. Coronado Cays "Hidden Gem" Has Expanded! 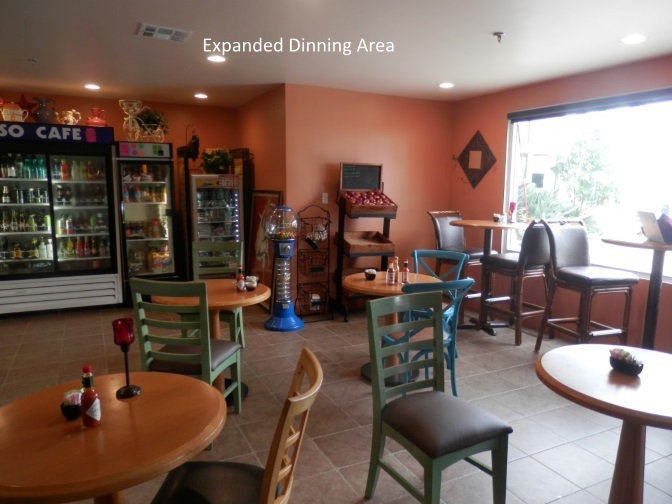 The Calypso Cafe Has Added More Dining Space and a Marvelous Gourmet Grocery! Calypso's Owner Hannan Martha invites you to the newly expanded Cafe and Grocery for new delights and sensational dining. The newly opened space is open and inviting, with welcoming decor, superb atmosphere and even some spectacular photography by Cays own Daron Case. You will feel at home and Calypso staff will make your dining experience one to remember and bring you back again and again for more dining delights. In addition to more dining seating, the new Grocery will excite your taste buds with gourmet meats and cheeses, fresh salads and sandwiches for a special picnic or intimate lunch at the Coronado Cays Shoreline Park across the street, or dinner just for two. There is a large selection of special wines and crafted beers to whet the palate and add to your dining experience. The staff can make recommendations for pairings to make it a perfect meal. Even your Electric Car will enjoy the experience with the three car charging units in the parking lot, so you can charge up while dining. It is the perfect place for family dining and Hannan's personal recipe meatloaf and potatoes is perfection and will be enjoyed by all! So good it will melt in your mouth and the kids will want seconds and Dad will be fully satisfied! The good news for Mom is there is no cleanup or dishes to wash, so a good time will be had by all! Check back Frequently for weekly specials and events. 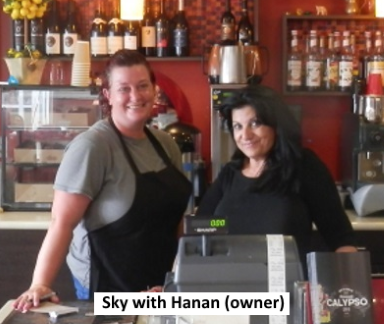 Hanan Martha, owner, and her staff will make you feel like part of the family when you stop in to dine. Expanded Space below offer plenty of dinning area and great grocery offerings.